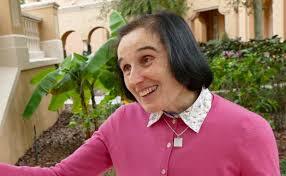 I had the opportunity to hear the beautiful Dr. Gianna Emmanuela Molla- daughter of Saint Gianna-speak at Father Gabriel Richard Highschool the other night, at an I.d. 9:16 Special Presentation. I am still glowing from the inspiration I received from her beautiful testimony. I have to be honest, when I first heard the story of Saint Gianna, I was confronted with my own selfish response to the question: if I were a mother who was expecting a baby and found out that I had a cancerous tumor growing alongside my baby, would I be willing to lose my own life for the sake of my unborn child? Even if it meant leaving three young children and the love of my life- in order to give life to this wee baby? I surely do not know. I am so stuck in my human mindset- a child needs it’s mother, and a husband needs his wife, certainly! I was so moved by Gianna’s message because I wasn’t expecting to learn so much from her. A person is a person no matter how small: Yeah, yeah- we already know that! BUT: Gianna and her dear husband Pietro understood the Catholic Social teaching that a baby, from the moment of conception is a person, with a soul, and an ability to change the world. Check out www.usccb.org for more information on this concept. It’s a profound thought to say that a persons potential is more precious than one’s own life- and I think that’s where the grace must come in. Gianna sacrificed her life for her child and in doing so, she was trusting God that He would provide infinite mercy and practical provisions for her family. Oh Lord, give me that faith! “The way of the Cross is the right way for me.” This statement brought me to tears. Living the way of the cross is a very contrary way of life in this day and age, especially for, welp: everybody. We want comfort, we want it our way, and we want it now. Offering up our sufferings isn’t pleasant and it isn’t easy. I think if any of us knew ahead of time the troubles we would face in this life, we may just opt out! But what I see is that by leaning into these sufferings, and giving them for the glory of Jesus, Gianna was able to take her heartaches and difficulties and turn them into joy. Actually, being there with her last Thursday evening and hearing her story was one of the most uplifting experiences I’ve ever had. She said that often when people hear her story, they start crying because they feel badly for her, for the cross she has had to bear- not having a mother! She said for us to stop it! Stop crying! Gianna said she has never felt alone. She said in fact, her Saint Mama and Holy Papa were there for her, and that her faith was alive each moment of her existence. “She is doing so much more in Paradise!” Gianna said that her mother, known as the Saint of Everyday Life- has done so much powerful intercession especially for couples wishing to conceive, that she has done way more work for others in heaven than she could ever accomplish here, on earth. This is another difficult concept. We feel uncomfortable in our humanness and inability to completely accept that the folks in heaven can actually work on our behalf. If this makes your brain hurt, or you are not Catholic, and feel this is a form of idol worship, I invite you to listen to Father Mikes super excellent video on this topic. Interestingly, the church goes through a process to decide if an individual can be made a saint, and this happened for Saint Gianna within the lifetime of her husband! If you want to know more here is an article on the five steps to becoming a saint. Choosing Closeness. The last and final point that I learned from Gianna was that the love of her parents was so real and so evident, that it literally changed the outcome of their marriage and family, and most likely everyone who knew them. In one of the letters that Pietro wrote to Gianna when they were planning to get married he said, “Our family will be a little cenacle.” It was that heart, with such a strong desire to do Jesus’ will that allowed Gianna and Pietro to keep their life on earth in perspective. She said, you know how you can live really closely with someone, even share a room, or a house– and not be close emotionally to that person, she described her parents relationship as being very close in that way-even though the six years they were married they did a good bit of traveling apart from one another…….. they still chose to write letters and know always what the other was experiencing. What a beautiful gift to their children and to us that this couple had that vibrant love, and that they used their vocation so fully, and so freely. If you wish to help support the community that Gianna Emanuella represents, she is on a mission to turn her childhood home into a shrine with perpetual adoration. For this she needs funds to restore the home and make the place accessible for all to visit and be touched by this modern saints life and story. I hope you are also inspired by this Everyday Saint- and that you and your loved ones are drawn deeper into the vortex of love that this faithful woman points to. Please share with me your favorite Saint! And even better- I issue you this challenge: what are you doing right now to help YOU become a saint?